In the vegetable garden, consider using thornless rose varieties, such as Rosa mutabilis, as supports for beans to climb up and through. In the vegetable garden, consider using thornless rose varieties, such as Rosa mutabilis, as supports for beans to climb up and through. The rose bush also protects the crown of perennial runner beans over winter and gives them a head start the next season. By using a thornless rose you avoid getting scratched when harvesting your crops. Roses also bring more bees into the vegetable garden, aiding pollination. Miniature, carpet and patio roses have smaller habits and more flowers, and therefore provide a bigger food source for pollinators. 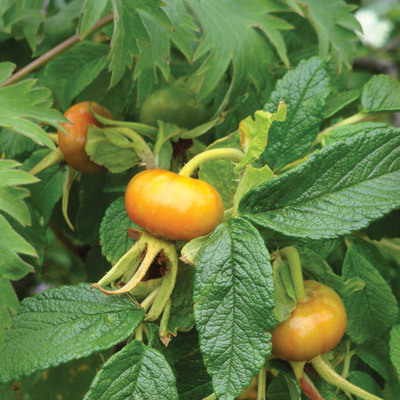 If you are into nutrition and feeding your body with fresh foods, fruits and nuts, then you may like to try making rose-hip syrup. In medieval times, wild roses were grown in monasteries and used as medicinal herbs due to their high vitamin-C content. Rugosa roses produce the biggest and brightest hips. 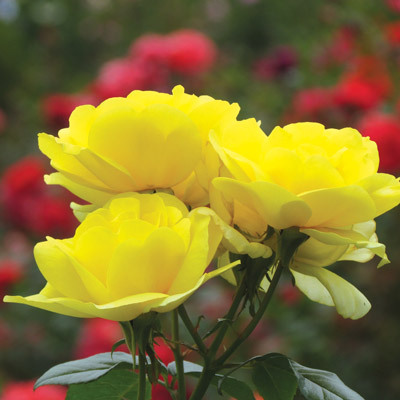 Garden designers understand the fact roses provide two significant, contrasting elements in the garden lush green foliage and flashy flowers. 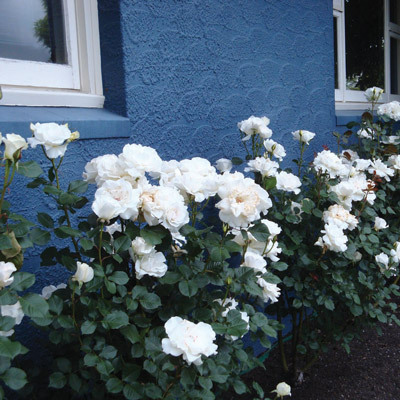 Roses are ideal options to plant alongside brightly coloured walls, fences and facades. Shown here, the ‘City of London’ cloaks a vista that matches the sky, and in its companion image, ‘Margaret Merril’ flanks the wall of a medical centre. Mass plantings of a single-coloured bush rose (‘Alnwick’) form a soft hedge along this path at Munstead Wood, England. Roses are forgiving creatures of habit, even when neglected they generally still deliver a few blooms, but when well-clipped and loved they flourish and reward your efforts with bloom after bloom. For an informal hedge, consider shrub and compact bush and carpet roses. 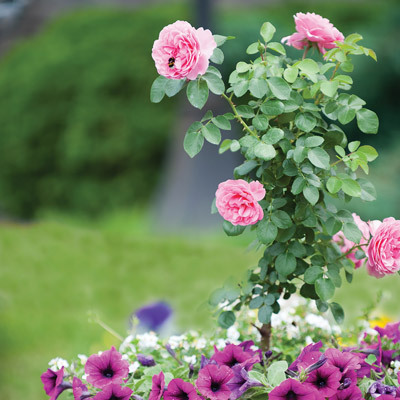 These types of roses can be trimmed with hedge shears once every three months, if you want to keep them in a more formal habit. Do you happen to have a barren space, clay bank or ugly area you want to disguise? Does it need to look good and limit people walking over the area? 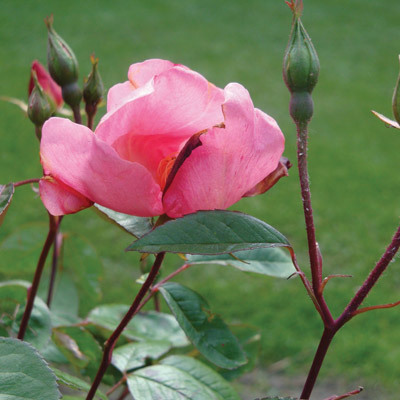 Consider prostrate ground-covering roses like ‘Nozomi’, ‘Pink Bells’, ‘Seafoam’ and ‘Red Bells’. Banksia roses can be grown in this way, too, and what’s lovely about these is that they are pretty much thornless. 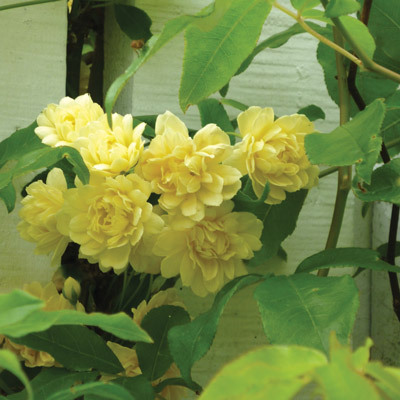 These rampant roses need to be kept in check if your area isn’t huge – they can easily scramble 2-3m each season. However, a weed eater with a metal blade trims them up nicely. A good option for under a teenager’s window perhaps? 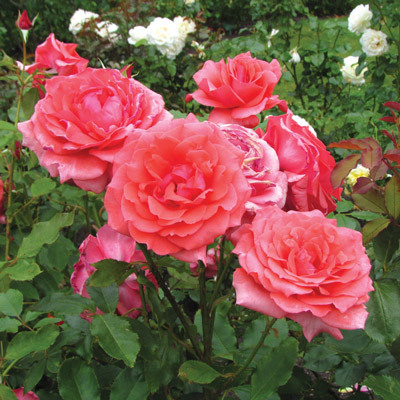 These rose varieties are often grafted onto standards to form weeping roses. Pillar roses are unique. Multiple grafts have been made up a tall, straight standard. Starting about 2m, they can be found up to 4-6m high. 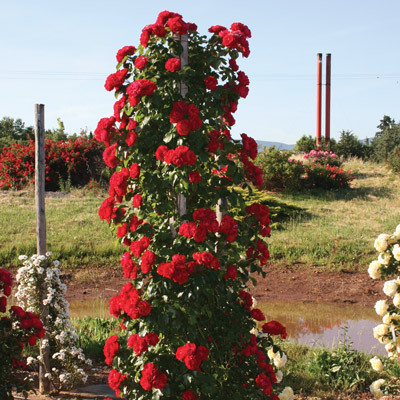 These roses are a superb alternative to pyramid cypress, topiary and statues. They do need plenty of support as the trunk can become very heavy once all the grafts are in bloom shelter from the wind is essential. Commonly grafted is ‘Iceberg’, due to its floriferous habit and reliable nature. Roses are quintessential pot divas, being proud show-offs demanding centre stage. The trick to getting them to flourish is placing them in full sun and choosing a big container. Do not even think about jamming their roots into something the size of a kitchen bucket they need something twice or three times this size. Always use the best potting mix leave that old stuff in the shed and invest in some new mix for the best results, you wouldn’t bake a cake with flour that was five years old, would you? Then team them up with something edible like parsley or chives, or underplant with bulbs, annuals or carpeting thyme. Make them part of the furniture! 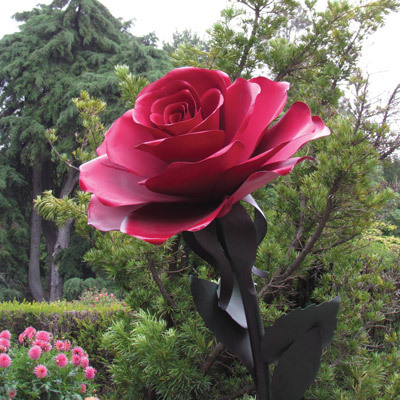 For those who enjoy garden art and sculptures, look out for something with a rose look and feel. This fine, yet heavy-duty artwork looks over the rose gardens at the Christchurch Botanic Gardens. Standing about 4-5m tall, this beauty never needs spraying or pruning! Garden art and roses go hand in hand, combining to deliver something quite special. 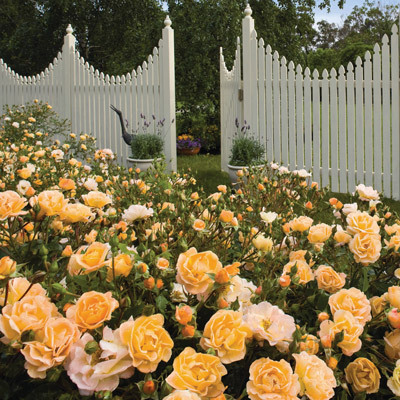 ‘Flower Carpet Amber’ teamed up with a picket fence for a classical, yet modern, look. While the term ‘cottage garden’ might send many people into a tailspin due to the misconception these types of gardens require a lot of time and expertise, modern cottage gardens suit mass plantings of one or more carpet-style roses. These roses survive and thrive in median strips in motorways and berms, providing a good security option around sensitive areas as people don’t like getting their legs scratched. Often when more than a card is relevant, a plant is the go-to gift option, especially for acknowledging momentous occasions, such as a wedding, departure, graduation, newborn or new home. 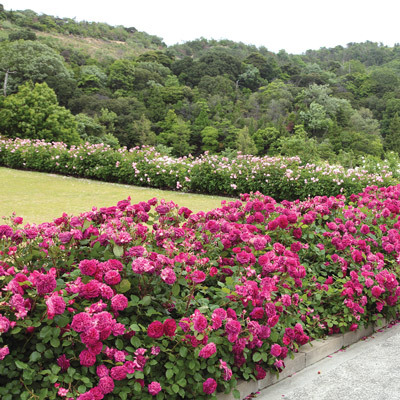 Hundreds of roses are planted each year as symbols of significance. Some popular options are ‘Sweet Dream’, ‘Little Miss Perfect’, ‘Faithful Friend’, ‘Wedding Day’, ‘Serendipity’ and ‘In Loving Memory’. 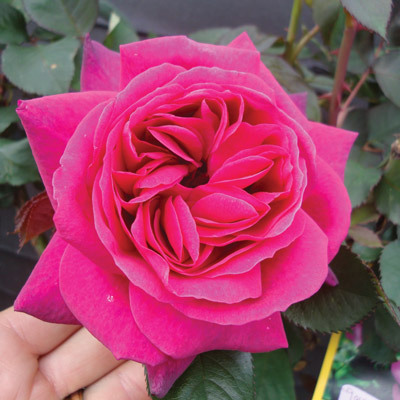 ‘Blackberry Nip’ offers gorgeous colour, a climbing habit and beautiful perfume. Although this is nothing new, rose breeders see perfume as fundamental in continuing the love and engagement of next-generation rose lovers. Arguably the best in the business for fragrance and reliability is ‘Margaret Merril’. However, the David Austin cultivars entice you with their traditionally heady perfumes. If you are going to plant a rose, why not plant something that is beautiful and perfumed as well. In life you don’t have to justify everything. Why try to apply reason when impulse and the love of something dictates otherwise? The rose might not fit your current planting regime, or you might not have room for it, but buy a large ceramic planter and all will be fine. So, for those who simply cannot resist a rose, it’s totally fine to find a home for it, just because you want to, after all, what better reason is there?